Calling all innovators in the field of learning and technology! 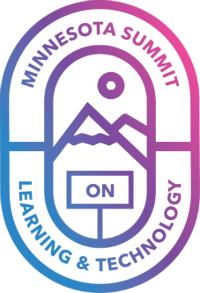 Join us for the revitalized 2019 Minnesota Summit on Learning and Technology, the premier gathering place for K-12, college, and university teachers, faculty, program and IT administrators, and staff. As technology in education has become an integral part of the learning landscape, more questions arise. This year, the Summit is encouraging exploration and conversation of complex questions, and a deeper look into the future role that technology will play in the teaching and learning landscape. This conference, formerly known as the Minnesota eLearning Summit, is back in 2019 with a new emphasis on pedagogy and teaching and new technologies and will feature presentation styles that inspire innovation and curiosity. Over the past century, much of the modern education system has been built upon values like standardization, efficiency, quantification, mechanization, and applied scientific knowledge. Each of these continue to play an important role in modern education and society. Yet, none of them are capable of drawing learners into meaning-rich, authentic, engaging, and transformative learning experiences. For that, we must learn from the best of ancient knowledge and modern research. With this in mind, Bull draws from his study of hundreds of learning organizations and environments to offer insights on what he refers to as human-centered learning experience design. This is an invitation to teaching and learning innovation that is built upon the the foundation of traits like adventure, learner agency, compassion, experimentation, mastery, meaning, and wonder.